Our vacation has been wonderful, but sadly, as these things do, it is coming to an end. 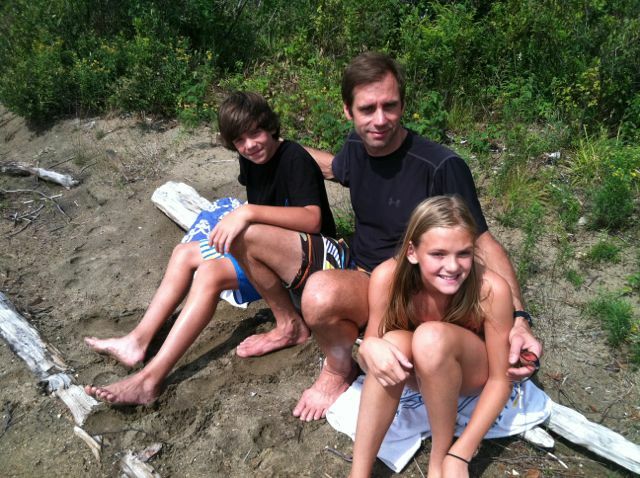 Here are a couple of pictures from this wonderful little beach we found on the end of Lake Placid! Lee has a few more days off, but Tuck has decided he’d like to wake up tomorrow in New Hampshire on his 14th birthday! So today we’re loading up duffle bags, beach towels and life jackets to make the trip back from New York, across Vermont, into New Hampshire. It’s been a marvelous vacation and so joyous to spend time with family and continue to share my book with the world. I have received so many beautiful letters from others who have read my book. I’m hoping next week to share a blog post with several of the notes I’ve received! I had a radio interview on Monday with Larry Whitler out of Ocala, Florida. Here is the podcast if you’d like to LISTEN. I had two radio interviews this morning; both were taped, so I’ll keep you posted as to air dates! The first was with David Freymiller’s Morning News KCTA-AM out of Corpus Christi, Texas, and the second was with John Ostapkovich’s News Feature on KYW-AM Philadelphia, PA. Vacation and book tour has left little time for my own writing, so I’d like to share an essay from another preemie mom that is truly one of the most beautiful, uplifting, life-affirming posts I’ve ever read. I hope you think so, too! The Air of Possibility by Shannon Pruitt of My New Favorite Day. Thanks once again for following me along on this wondrous ride! How is your summer going? Can you feel fall and school bells lurking around the corner? Greetings from Lake Placid, New York, where my entire family has gathered for a week of summer fun in the former Olympic village! 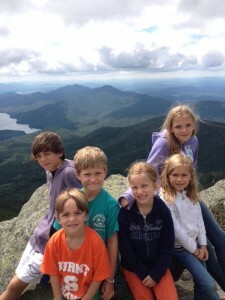 Here are all the cousins on top of Whiteface Mountain! And while we’re busy enjoying our family time, Preemie is busy making her rounds! There is an article I wrote featured on Hand to Hold’s website Preemie Babies 101 about the struggles of breastfeeding a preemie called “Changing the Definition of ‘Nursing’ Your Preemie.” Click on this linkhttp://www.preemiebabies101.com/2012/08/nursing/ to check it out! A 30 minute interview about Preemie aired on Sunday 8/5 in Seattle on a morning program called “Inspirational Women with Kate Daniels.” If you’d like to listen to the podcast, click on this link http://warm1069.com/inspirationalwomen Then click on the 8-5-12 interview! Tonight I have the honor of joining The Lake Placid/Saranac Lake Book Clubs as they discuss Preemie. Lee and the kids are going to walk me over to the meeting so that everyone in the group can meet the main “characters” in the book before we start our discussion! Last night we had a birthday dinner because tomorrow on August 8th, I turn 45! Here I am with my brother, John and my sister, Libbie at The Mirror Lake Inn. I love a quiet, reflective birthday, so tomorrow I plan to paddle board on Mirror Lake, take a long walk around town, sneak away for a 9:05 live radio interview on The Mark Johnson Show on WDEV out of Burlington, Vermont (!! ), pull out my notebook and pen to chronicle some of the past year’s noteworthy events (I’m sure I’ll find a few things to write about!) and enjoy a meal at our favorite Lake Placid haunt, The Caribbean Cowboy! Gotta love a birthday!! Thanks again for all your continued love and support! How is your summer going? Are you in a situation where you’re juggling work and family life? Please don’t be shy about leaving comments! I love to hear from you! There are two interview clips, so please be sure to watch both. My intention when I set out to write Preemie was the hope of helping others who found themselves in a situation similar to ours. I really hope that these videos will spread that message. You can help by sharing the link with anyone and everyone you think might benefit from seeing the videos or might know someone who would. Deepest thanks and love to you all! This is kind of exciting, isn’t it?